I think all new bloggers think that if they write something fabulous and post it, people will find their blog and their views will skyrocket and they'll be the next big thing, (we all start out with hopes of being wildly famous). Unfortunately, 99.99% of us are sadly disappointed when we check and find that 3 people have read our first post. The thing is, people can't find your blog if they don't know it exists - you can be pouring out amazing stuff but nobody can find it. If you want to be found then you need to choose some Social Media sites to share your post on - Pinterest, Mix, Twitter, Instagram, Facebook, Flipboard, and there's many others I haven't even tried. You don't have to use them all (you'd spend your whole life on social media if you did) but you need to choose a few that you feel comfortable with and put yourself out there. People will find you when you and other bloggers share your posts on social media. Why make it hard for people to share your stuff? They'll look for a share button and if they can't easily find it they'll give up and move on. I love floating share buttons on the side/bottom of your post - they're free from lots of different apps (I use Shareaholic) and make it simple to click and share. When you add images to your post please use the Title and Alt Text attached to your images to add a little snippet to describe the picture or your post (or both). You can be really on the ball and throw in a few keywords - but at least write something descriptive. I can't begin to tell you how many blog posts I've pinned a picture from - only to find it says IMG1 or some other random group of letters that mean nothing to the people who see that pin later down the track on Pinterest. Take ten seconds to write a sentence in your Alt Text - it's worth it. If you want to be found by like-minded bloggers, join a link party or two and don't just drop your post link and leave. Take a few minutes to see what others have posted. A large percentage may not interest you, but there's always a few that will catch your eye. Stop by and visit them and please leave a comment - and not a two word "great post" cop out either. The more you visit, the more likely you are to find your tribe. My blogging buddy Sue and I run a Wednesday Midlife link party - Midlife Share the Love - it may be a good fit for you - if not there are several in my link at the footer of this post that might suit you. I love the Women of Midlife group and Sizzling Towards 60 - both are great places to share your post and are full of other people who are keen to interact and help if you have a query. There's so many Facebook groups for different types of blogs - look around, ask for suggestions, try a few out (it's easy to leave if they're not "you"). Once you find a couple, make sure you contribute and pull your weight - sharing is caring. You meet people in the blogging world by finding them on social media, or from link parties, or Facebook groups. You get to know them by reading their posts and leaving considered comments. They'll visit back - I promise! You'll start interacting and before you know it, you'll make blogging buddies all over the place. You'll stop wanting to be the next best thing in blogging, and you'll start to realize that it's all about connection. 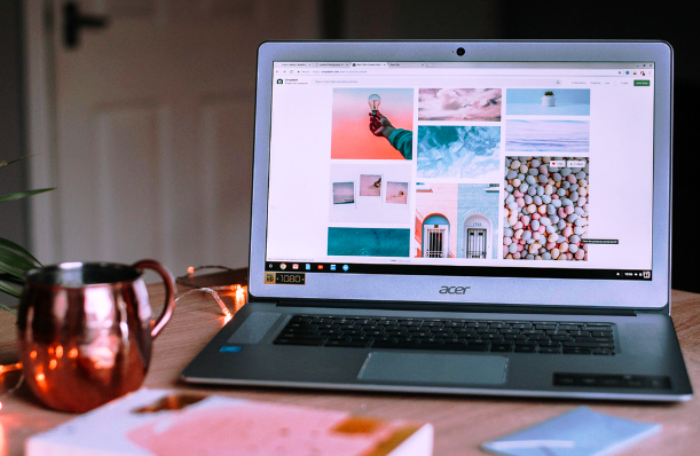 When they find you, make sure your blog is easy to read - break up your big chunks of text into manageable paragraphs, use paragraph headings, choose a font that's easy to read, don't write on a coloured background, and maybe even include an image or two to make it pretty. Also, go easy on your pop-up boxes and ads - people (like me) hate having to click through half a dozen annoying boxes to be able to read what you've written, and annoyed people won't stick around to read that wonderful post that you've put so much effort into. Well, that's my short list of tips. Do you have any suggestions to get the word out there about the great blog posts we write? I'm amazed, and beyond grateful, that people read what I write. The connections, friendships, and interactions are what makes this blogging journey so much fun. Great information Leanne - thanks for sharing! As one working to grow my blog, this is very handy! I think my first lesson learned is that I chose a website platform that was not very friendly to comments and follows -- so I'm backtracking by transitioning to another platform this weekend. Live and learn! Your blog might just keep me from other mistakes -- thanks. Hi, Leanne - These are awesome tips. The only one that I can think of adding is to consider putting your blog URL as an automatic signature on your email. There are scores of people whom I've needed to email (people whom I volunteer with, neighbours, etc), who later said "I never knew that you're a blogger". I've definitely acquired some new followers this way. And the signature is super easy for anyone to ignore if they are not interested! (Bloggers may also wish to make a 'blog business card' to have handy just in case anyone asks! I've been thinking about adding my url to my blog signature Donna - but I wonder if it would look strange when non-bloggers get an email from me? I might give it a try and see what the response is. Leaving your url in your blog comments is also an easy way for others to find you. Ha! I couldn't pass that one up. This is an excellent post with great, informative content. I especially like the tip about adding captions to your photos I never even thought of this! And the bonus tip about breaking up the content into smaller pieces with headers. I need to work on that one! I'm glad you found the tips helpful Trisha - breaking up the text makes it a lot easier for others to read - I used to just have paragraphs, but now I do headings as well and it makes it so much easier to skim through or to read thoroughly. SEO is super important Min and I still haven't figured it out properly yet either. 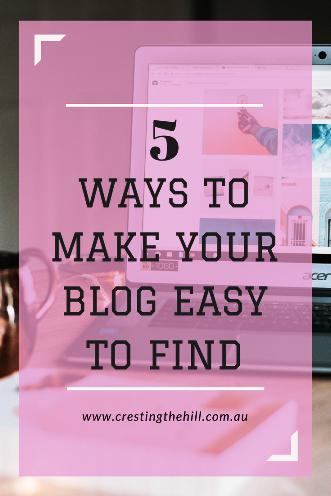 I left it out because I wanted to pick easy tips for new-ish bloggers. SEO just scares the socks off most of us! When I first started blogging I thought that if you write... they will come. Ahaha... that is not how it works. Everything you have shared is a fantastic start to getting your blog and name out there. I was the same - and then I realized nobody even knew that I wrote a blog - so how could they read it? Then I started to find my tribe and realized it's about the connections and friendships - not about being famous. The number of times I've pinned things that say IMG1 amazes me Jo - even if you just title the photo before you upload it to your blog, you're a step ahead of it not having anything at all. 10 seconds to make something pinnable is a win in my books. Hi Leanne great tips and as Jo Tracey says the text on photos is important. I love how you have been creating a pinnable image which is a summary of your points if you aren't using a quote. Great idea. Hi Leanne, All good points for people. I'd echo Min's comment about paying attention to SEO, and would strongly reinforce your closing comment about blog design. When I was deciding which blogs to follow for A-Z, I instantly deleted dozens that were either loaded with pop-ups and ads, or badly designed - like yellow print on a black background. What's with that? I find blogs that are easy to read and those who don't have numerous pop-ups much more appealing than ones I have to struggle through Karen. I did the same with the AtoZ - it had to be an easy read or I moved on. Good stuff, thanks Leanne! I don't ever worry about the alt text as a description. I usually put a keyword in there! Thank you for that advice. Keywords are great Shirley - but it really helps if the description makes sense and encourages the person pinning it to click through to your blog. 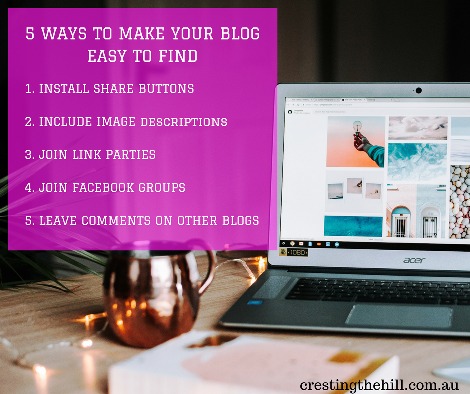 These are just some simple tips that new bloggers might find helpful Kathy - but I also notice long time bloggers who could make simple adjustments to encourage people to share their posts. This is exactly what I needed when I started. I had no idea about how to go about doing this, and it helps so much!! I was the same Jodie and my DIL has just started blogging - these are some of the tips I've been passing on to her - and I thought I might share them for anyone else who was looking for tips that didn't cost them anything. Another fabulous post filled with great info! Starting out is hard. Consistency and sticking it out are the keys to success. Ugh! I’m still posting comments on your blog with my 10 year old profile! One day I will figure out how to change that! I love your 10 year old profile Elena - you look so young and sassy :) And thanks for your kind words - as the Pinterest Queen I thought you'd totally get how much difference an image with some alt text makes. Oh, my, yes! All of the above! It's not rocket science Diane - but it's stuff I wish I'd known when I started and knew absolutely nothing about how to get my blog seen. That's true about guest posting Pat - and something I'm about to take up a notch next month - stay tuned for my post in the next week or so. I'm so glad #MLSTL has been helpful for you in building engagement - it's a fantastic group of bloggers who turn up each week - I just love co-hosting it. I do all of these things except for the links parties and the alt text...I though it was something totally different..so now I will fill it out...thanks for the tips! I didn't know what it was either Renee - I just add the same description that I put in the image description - that way it should keep everyone happy - it certainly makes my pins more understandable. And feel free to join my link party any Wednesday - it's a great group. I feel like I'm doing all of these things but maybe not enough? I'm just on Pinterest and Facebook and my blog got a bit of attention for about a month, but now it's decreased significantly, even though I'm doing all the same things. How do I keep (and grow!) interest? It's the dilemma we all face isn't it? FB changed its algorithms and killed a lot of referals that used to come from my FB page. I really like StumbleUpon and now I've just read that it's closing at the end of June - it never ends! I think you just keep writing what you love and share it where you feel comfortable and people will still find you. Good tips. I try to focus on social media and promote, promote, promote. It's tricky to get the balance right isn't it Deb? I love writing and I love when I have ideas popping into my head - I hate all the SM circus hoops you need to jump through to get your post seen. I do the minimum and I'm happy to take whatever engagement readers are nice enough to give me. Thanks Hannah - you inspired me to write this because there are so many little things that we learn as we go along that aren't written down anywhere and it can be so helpful if someone mentions them early in the piece. I HATE pop-ups of every sort and I also hate the captcha code that is in a lot of comments these days. Got a question for you - actually two. I notice many folks are now creating a large graphic with blog post title and the blog link. Curious as to why - thinking for pinning on Pinterest? The second question is what program or website are you using to create yours? Hi Donna - Question 1 - Pinterest still likes vertical images and they pin better than the square shaped ones. I actually prefer the square shape for most of my pics but always add a rectangular one at the end (with the same "branding" each time) to make it easy to pin. Oh, and I not only use Pixabay and Morguefile, but I have photos on both. ;) Thanks!!! My readership increases when I'm able to participate in these link parties. Unfortunately, my internet suffered issues due to a ice covered relay that looked like a Popsicle and was still covered when I left and headed into the city. Now I have a great internet. yeah. Thank you for sharing. I'm so glad you're back in the world of speedy internet Lee - nothing is worse than a really slow connection! Link parties are such a great source for finding other bloggers who become part of your tribe. That's why I wrote it Alana - I've been helping my DIL with her new blog and the things that we take for granted now are all things you have to figure out when you start - I wish someone had given me free and easy info when I started a few years ago - it would have saved some blood, sweat and tears! I think you have covered most of the important points, Leanne. Sharing on other platforms and joining blog fests and blog parties is a good way. I liked that bit about having short paragraphs and having sub-headings. Long paras are hard to read. I find big blocks of text really off-putting Pradeep - nobody these days has the time to focus on so much writing - when you break it up it helps them pick and choose what to read and to stay a little bit longer. Leanne these are great tips. I will have to figure out what Alt text is. lol I do break my paragraphs up but I don't put headings on them. I have an on going battle with SEO and keeping my posts readable.Even after two years of blogging I am still learning. I hate SEO Victoria - I try to do it but I have a big learning curve in that area - along with the whole Keyword thing. I'm planning on being more intentional in that area sometime - just not yet! Great tips, Leanne. I stumbled upon most of these as I went along. How nice for someone just starting out to have all of these tips in one place. Happy Sunday! Thanks Christie - I was the same and when my DIL started blogging recently I thought that it might be useful to put them somewhere easy to find - they're all things that we pick up as we go along but it's nice to know them up front. Thanks for commenting on my profile on Blogging Grandmothers! These are nice tips. I've also heard using SEO friendly titles and words in a blog post is also helpful to drive traffic to ones's blog. It shows up in Google searched better. I agree with you that my blog is outdated, but since I've been blogging 10 years I'm way past the idea of becoming rich and famous from blogging, and I'm content to keep it low key. Maybe someday when life slows down a little, and I have more time to work on it, I'll update to a new platform. I don't think it's outdated at all Pat - it's just nice to make a change sometimes - gives your blog (and you) a fresh lease on life. I know when I changed mine I wished I'd done it much earlier. The SEO stuff is something I really need to work on - Google search engines are a complete mystery to me because they change their algorithms so often - just to mess with my head! I totally agree with these tips Leanne, and wish I’d known them earlier in my blogging life!! I can’t think of anything to add at the moment. I find it hard to pinned a post if it doesn’t have a pinnable image but you’re always on the ball!. I try my hardest Deb - FB has become useless for growing my blog, StumbleUpon is closing - so I guess Pinterest needs to work for us as much as possible! Well set out wise tips for making blogs find-able and pleasing to read. This post rose to the top of the most popular on the Blogger's Pit Stop, it will be featured this week. Proving your points. Thanks so much Kathleen - it's nice that it might have been helpful to some of the newer bloggers - some of the suggestions were well received by my DIL who is a new (and rapidly growing) blogger. I learned them along the way too Betty - I just wish someone had told me how to do them when I first started - rather than through all that trial and error! These are all good tips. I never used to bother with alt tags but then I read about how important they were and now I make sure I always take the time to write a description for them. It seems like a lot of people find my blog when they are looking for an image. Link parties are probably the thing that has made the most difference for me in gaining followers, especially in the early days. I've only recently joined a few blogger Facebook groups. I'm terrible at the image descriptions. not too bad at the captions but I don't use good saving "names" for searchability. Mostly Facebook "numbers" as I tend to pull my pics off my Facebook. I understand where you are coming from here and I can relate. I haven't done enough to promote my blog. I don't really understand the alt description and the description for images and what the difference is, so this is helpful. I usually do write something, but I have never been sure I am doing it right! Great advice, Leanne. I am still fairly new - started blogging in earnest about a year ago and love picking up tips. I have share buttons but they are tiny and at the bottom of each post. I like the floating ones you have. I'll check out Shareholic. Thanks! Found you through Lifestyle fifty. Hi Emily - I hope you do end up checking out the floating buttons - they make sharing a lot easier for visitors to your blog. Leanne, when I learned about #2, the photo description thing, I was amazed that it had taken me so long to learn of it. Really. Can't remember now where I read it, but I had been blogging for several years before I saw anything about it. Thank you for telling everyone about it. Hi Jean - I can't believe that people still do it with every blog post - it takes so little time to copy and paste something into the title and alt box and when it's saved to Pinterest it makes a HUGE difference. Glad you're on board with it - especially for your lovely food photos. Excellent advice and reminds me some things I've been slacking on, thanks Leanne, for the reminder. Dropped by from #BloggersPitStop (your tip #3).